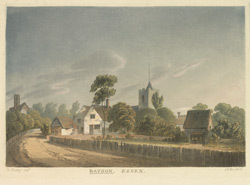 This is probably a view of Raydon in Suffolk, near the border with Essex. The National Gazetteer of Great Britain and Ireland for 1868 comments 'Raydon, a parish in the hundred of Samford, county Suffolk, 3 1/2 miles S.E. of Hadleigh, its nearest post town....The village, which is of small extent is wholly agricultural....The church is dedicated to St Mary'.